The IMS Common Cartridge standard allows publishers and content providers to create platform-independent packages of resources (content, assessments, question libraries, discussions, etc.) building on existing IMS content and QTI quizzing packaging standards. Package creators can optionally protect the package, requiring users to authenticate with the creator using web services before importing or accessing protected resources. Common Cartridge was designed to provide a standard way to package and protect content, as opposed to each publisher or each learning management system creating a proprietary method of protection and enforcement. For more detailed information on the Common Cartridge project and its role in the Digital Learning Connection, visit the IMS Global Learning Consortium website. You can import IMS Common Cartridge packages and expand your unit offerings to include a wide range of innovative, platform-independent, and diverse unit content from publishers and content providers. Importing an IMS Common Cartridge package follows the same process as importing other files of supported import formats. Importing a cartridge automatically creates the applicable content, quizzes, questions, etc. in Connect and makes them immediately available for use. Package creators have the option of protecting cartridges on import or forcing the user to enter an access code at the beginning of the import process. Any protected resource that imports from an IMS Common Cartridge package displays a Protected icon beside it. When users first try to access a protected resource, they are prompted for an access code, which is distributed by the package creator. Entering the access code and accepting the license agreement initiates the electronic authorization with the package creator’s authorization web service and unlocks the resource for the user. The user is not prompted to enter their access code when accessing additional protected content from the package until the authorization period ends. The length of the authorization period is determined by the package creator and changes from one package to another. If a unit contains protected resources from multiple packages, users are typically prompted for authorization only once per protected package. Protected resources can be copied between units, but cannot be exported from Connect. The following table provides an overview of each version, including a summary of the features and any other technical details worth noting. In the resource metadata context, includes the higher education value. Contains metadata for the intended user roles: Learner and Instructor. These are the user roles that can view the resource. Contains the intendedUse attribute for Web Content Resources. This attribute must contain one of the following values: lessonplan, syllabus, or unspecified. The package file should have the extension .zip. Cartridge manifest metadata must refer to version 1.0.0. Offers easy support and integration with IMS Learning Tools Interoperability (LTI) v1.0 resources. You can integrate rich learning applications or premium content with platforms or other systems from which applications can be launched, without additional customisation. In the resource metadata context, includes the following values: higher education, school, training, and other. Adds metadata for the Mentor intended user role. The intendedUse attribute for Web Content Resources is optional in this Cartridge version. IMS Common Cartridge 1.1 supports LTI links through Brightspace Learning Environment User Interface, Bulk Course Create (BCC), and Course Import API. The package file should have the extension .imscc. This extension helps identify files that are likely to be Common Cartridges. Users are notified in the processing logs when the resource is imported successfully; however, their intendedUse type is discounted. Cartridge manifest metadata must refer to version 1.1.0. Includes metadata for curriculum standards, which provides the option to associate the cartridge, resource, or question item with zero or more curriculum standard identifiers, from one or more providers. Users can use any curriculum standard, provided that it supports unique identifiers. The intendedUse attribute for Web Content Resources offers a new attribute called Assignment. Curriculum standards metadata is recognized in v1.2, but is not supported by Brightspace Learning Environment. As a result, it is discounted, and users are instead notified in the processing logs whether their data was imported successfully. Common Cartridge specification has deprecated authorization to the Course Import workflow. D2L still supports it, but recommends that users use Learning Tools Interoperability (LTI) links to access remote/secure content. Cartridge manifest metadata must refer to version 1.2.0. 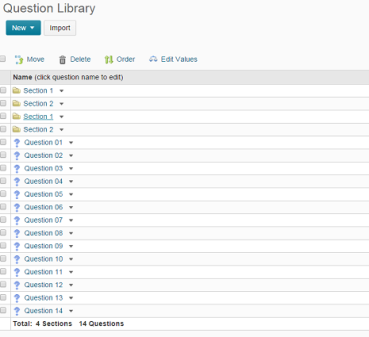 Allows you to import multiple question banks within a single cartridge. Provides the ability to specify Common Cartridge XML descriptions within an imsmanifest.xml file, which are imported by Brightspace Learning Environment. Provides the option to add metadata to LTI links. In Brightspace Learning Environment, this metadata is incorporated into the content topic so that it can point to the LTI link. Question banks have no titles, so they are categorized as "Section 1", "Section 2", and so on, in Connect. Question banks can be translated into any language that D2L supports. Connect imports files with these extensions into the Manage Files tool, but does not create a content topic because the content type is not currently supported in the application. Users will receive a message about this in the processing logs. Cartridge manifest metadata must refer to version 1.3.0.